Click the photos to view each of the flower-themed sun catchers up-close. 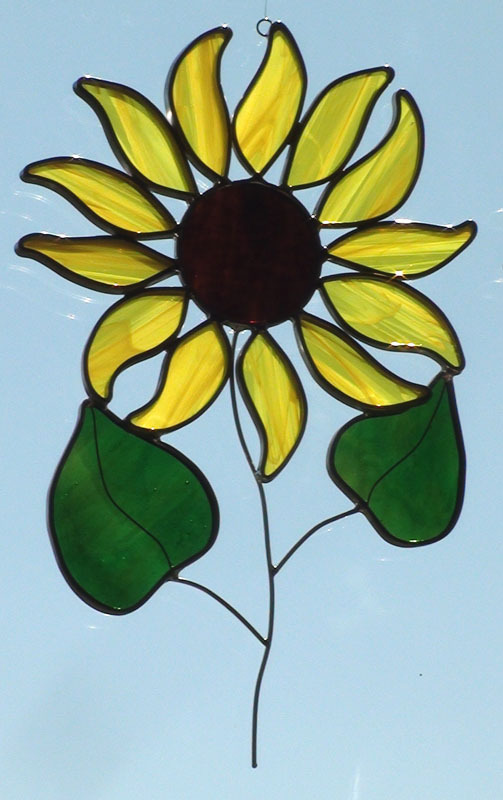 DESCRIPTION: This leaded stained glass sunflower is a popular summer and fall flower every year. A textured brown and amber center is surrounded by bright yellow random shaped petals. No two petals have a repeating shape as in nature. A red ladybug sits between the wire stem and green leaves. A popular multi-season decoration measures 10 inches long and 7 inches wide. 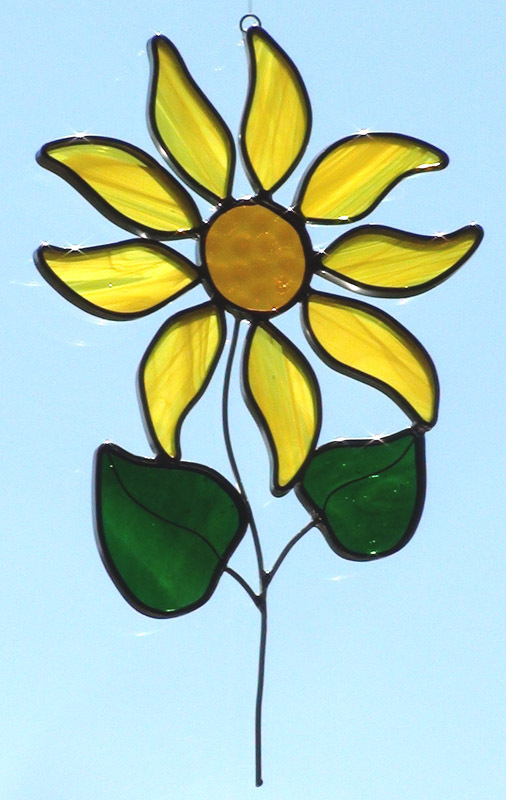 DESCRIPTION: This leaded stained glass Sun Flower is a smaller version of the Large Sun Flower. The yellow petals have the same random shape around a brown or amber circular center with green leaves and a wire stem. It is a delightful decoration for all seasons. The slightly smaller size measures approximately 9 inches high and 6 inches wide. 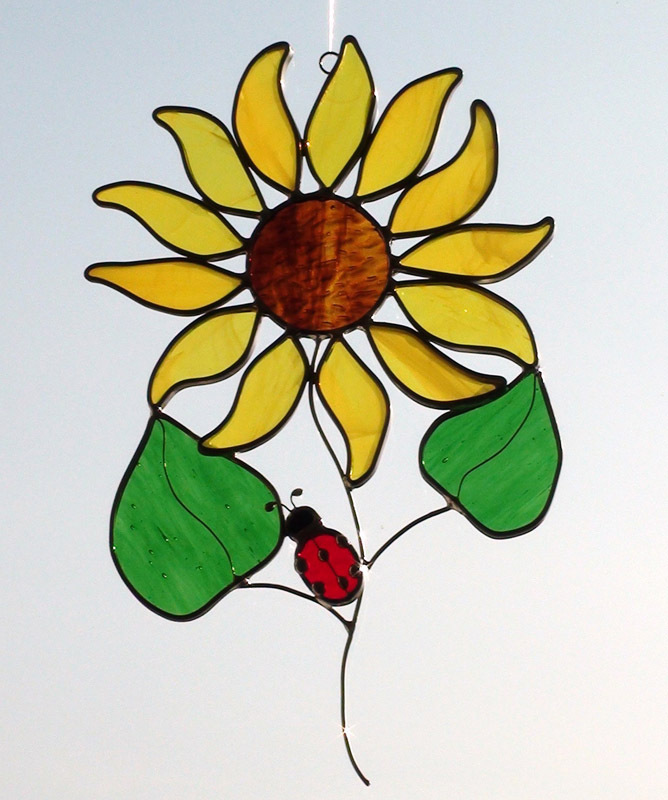 DESCRIPTION: This cheery bright yellow sun catcher is a perfect decorating accent for any season . Leaded stained glass petals circle the brown and amber center. Each petal has a random unique shape like flower petals in nature. A red lady bug sits on the wire stem nestled between green leaves. Measuring approximately 9 inches high and 6 inches wide it is slightly smaller than the Large version. 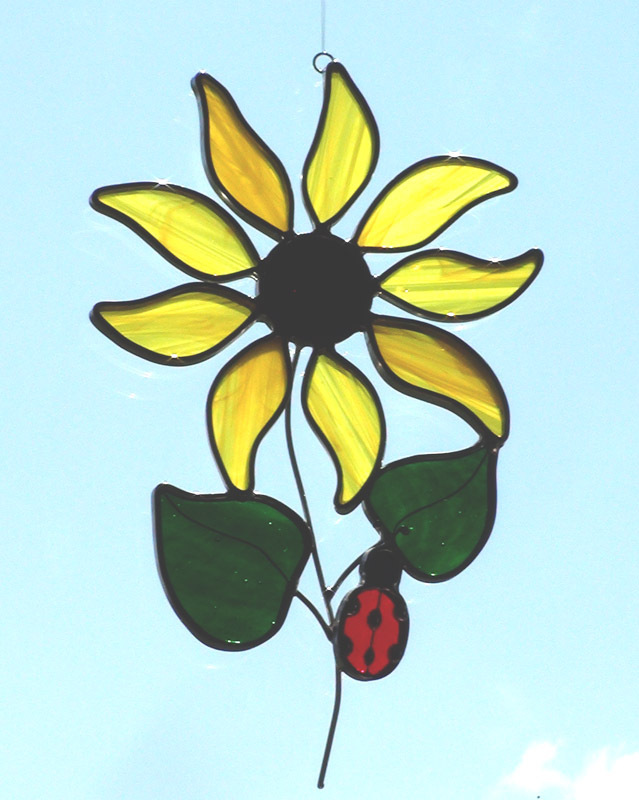 DESCRIPTION: A cheery bright yellow stained glass sun catcher that will brighten up your room during any season. Random shaped natural looking petals surround a brown and amber circular center. Green leaves are attached to the wire stem. This sun flower measures 10 1/2 inches high and 7 inches wide.